The skies opened as we arrived in Mahdia and looked half-heartedly for the supposed unofficial camping place between two closed hotels… we didn’t find it and made for a hotel in the Medina instead. The first one we looked for was highly recommended by our guidebook, however it never did finish the renovations they were talking about in 2008 and was still closed, work part done. We went for the next option – Hotel El Medina, and found it delightful and cheap. The room gave out onto the first floor of the central courtyard and by now the rain was pouring in. We didn’t relish the thought of going out again, waiting some while for a lull so we could go and get our stuff from the van, thankfully parked not faraway. It kept on coming though and we were hungry. Where was going to be open on such a horrible night? We asked the reception chap for some recommendations and started to make our way to where we thought the restaurant was. Water was teeming down the streets and the cobbles were slippery. In spite of the rain, we were approached by someone purporting to be a member of the family running our hotel. He took us straight to the restaurant … possibly it was the only one open in the town? Worth a small tip to get there quickly althiough we arrived absolutely soaked through, and cold as well as wet. We had a pleasant meal there though for very little money. Back at the hotel it was freezing in the room in spite of our hosts’ best efforts to provide a portable heater, which he had to swop around the different rooms. I think the European cold spell has made its presence felt on the southern shores of the Med, and they’re not used to it, and we’re not used to it any more either! What a difference the next morning. The sun was shining brightly. We had decided not to stay another night in Mahdia though and our friendly hotel staff were worried that they’d done something wrong. We couldn’t fault the service, we just couldn’t face another cold night. We set out to explore the Medina, which was starting to dry out. As with the other towns along this stretch of coast the new town boasts many faceless hotels and complexes, but Mahdia’s Medina sits apart from this, on a spit of land not as much as half a kilometre wide. 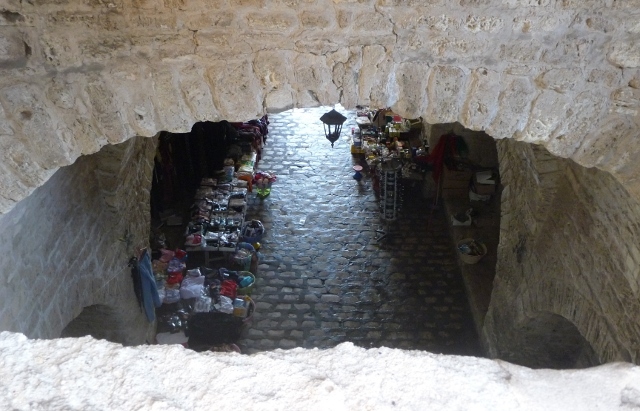 It is small and beautifully formed with its Skifa el Kahla (meaning: the dark passage) – a 16th century rebuilding of a 10th century fortified entrance. The deep tunnel like gateway was described by Olfert Dapper (translated by John Ogilby) in 1670 as “so dark that it is terrible to strangers, seeming rather a murdering den than an entrance into a city”. It is an impressive building but much friendlier now, with trinket stalls and not a murderer in sight. Looking down into the entrance tunnel. Next door to the Skifa, we visited the archaeological museum, which was impressive. Not large but airy and bright and showing off mosaics, statuery and traditional wedding costumes amongst other things. As so often in this country, we were approached by a member of staff, or just their friend, who opened up rooms for us and then promised us a special view of the city. We were dubious, but followed along nonetheless expecting to be led up to the roof of the museum. Instead he took us through the backdoor and up the Skifa – right to the top of the fortification. We were thrilled and there were great views as promised. We strolled through the fish market, and the rows of live chicken and egg shops, and up through the narrow streets past the delightful Place du Caire with its cafés. 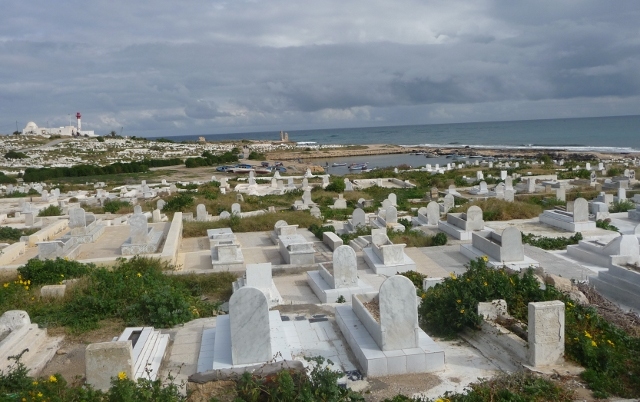 A meandering cemetery stretches across the sea end of the Medina down to the shore where there are fishing boats moored in the remains of a ancient port. There is also an imposing fort and a huge mosque, though this latter was rebuilt in the 19th century. 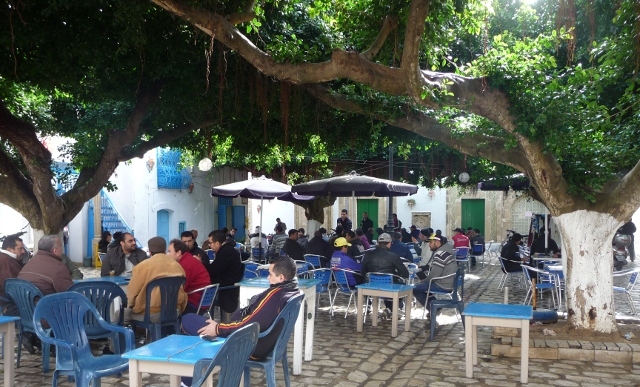 So really we had done Mahdia and although we felt a pang of guilt at leaving a charming place so soon, we also wanted to head on to El Jem while the weather still held good. 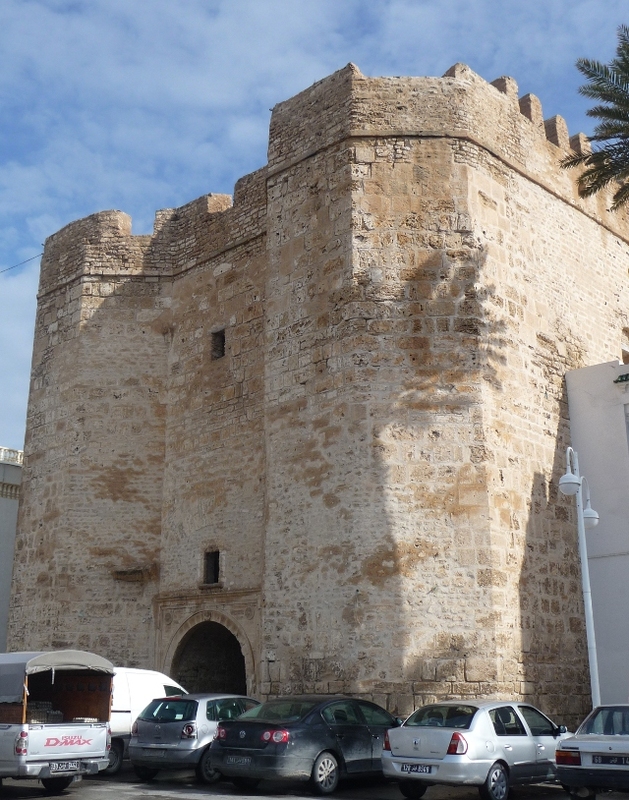 This entry was posted in By Country - Tunisia, Travel stuff. Bookmark the permalink.